This disney papercraft is the Mr. Incredible, based on the animated film The Incrediblesby Disney / Pixar. 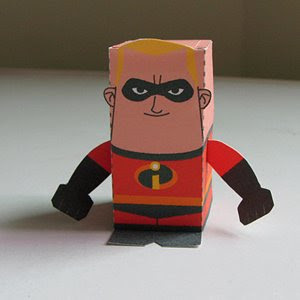 The papercraft is created by Toy a Day. Robert “Bob” Parr (aka Mr. Incredible) is the protagonist of the film. Bob possesses tremendous strength, and heightened resistance to harm. He also has enhanced senses. He is married to Helen Parr, the superheroine known as Elastigirl, and they have three children together: Violet, Dashiell Robert, and Jack-Jack.